'Angels' From Orlando's Theater Community Guard Mourners From Protesters : The Two-Way As mourners hold funerals in Orlando for the victims of Sunday's nightclub shooting, the Orlando theater community is banding together to protect them from anti-gay protesters. Counter demonstrators dressed as angels to show support and solidarity block the view of protesters near the funeral service for Christopher Andrew Leinonen, one of the victims of the Pulse nightclub mass shooting, outside the Cathedral Church of St. Luke on Saturday in Orlando, Fla.
As mourners hold funerals in Orlando for the victims of last week's nightclub shooting, the city's theater community is banding together to protect them from anti-gay protesters. 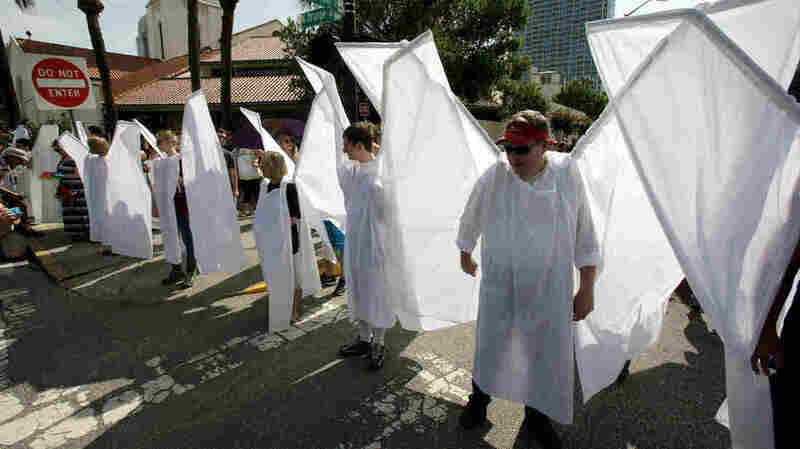 Dressed in white and wearing large wings, the "angels" stood in a row in order to shield the family and friends of the victims. The idea, according to American Theatre, is to allow the mourners to "grieve in peace." "We didn't know that anyone would protest the funerals here in Orlando, but that is now happening, so a counter-protest so that people that are attending those funerals and those that are in mourning don't have to deal with hate is an important thing," Orlando Shakespeare Theater's Jim Helsinger told the Miami Herald. "I don't have any money to give, but I can spread love and I can spread hope," volunteer Jeannie Haskett told the Herald as she pieces together the wings. "I was just waiting for an opportunity to use one thing I do have, which is the skill to sew." The Westboro Baptist Church has a long history of disrupting funerals. And as Helsinger explains, angel wings have been used on previous occasions to protect people from anti-gay protesters. "Angel Action Wings have been done a number of times over the past 20 years, and were just another following forward and positive support of the fallen and in support of our community and Orlando," Helsinger tells the Herald. "The idea came from Romaine Patterson, who used what she called Angel Action Wings in 1999 to fight back against an anti-homosexual group when the members picketed the trials for Matthew Shepard's killers. The killing of the 21-year-old for being gay inspired Moises Kaufman and the Tectonic Theater Project's The Laramie Project." The volunteers set up a rotating shift system to protect mourners in central Orlando on Saturday, the Orlando Sentinel reported. As we reported, only a handful of anti-gay demonstrators actually appeared outside the Cathedral of St. Luke on Saturday, where the angels were standing guard. But "they were outnumbered and out-voiced, though, by hundreds of people who showed up to support the victims and their grieving families." A video posted on Twitter shows the crowd of mourners cheering as the group from the Westboro Baptist Church left the scene. Memorials continue at the Cathedral of St. Luke on Sunday, as NPR's Aarti Shahani tells our Newscast unit. She adds that some 20,000 people are expected to gather this evening in a procession from the cathedral, which will end with a candlelight vigil at a lakeside park.